Are we making this a regular thing? You bet we are. Twitter is always at the forefront when it comes to cracking jokes at Bollywood. And I am always on Twitter. So, with our powers combined, presenting to you the best jokes that were cracked about Bollywood on Twitter in the month of March. From Sonakshi Sinha to Hrithik Roshan's' Dhoom to Akshay Kumar's Calvin Klein Ad - nothing was spared on that website, which let us admit has been the best thing to happen to humanity. Also, please remember, all is being said and done in good humour. 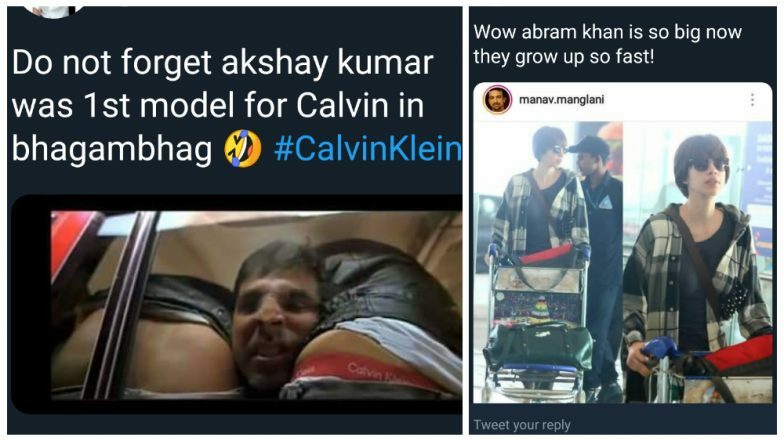 50 Funniest Bollywood Tweets That Entertained Us More than the Movies in 2018. Starting off with the one tweet that summarised March. By one and only, Varun Grover. And if you don't get this one, please never call yourself a Bollywood fan ever again. No, seriously. Now that is a Race sequel we all are on board with. NO? Just me? Ohkay! Akshay Kumar is already in the studio, shooting Mission Shakti movie with Rakesh Roshan's Koi Mil Gaya computer. FINE. This one's by me. And it is not even a joke. But, look, it went semi-viral. And I need answers. Am I the only one wondering Madhuri Dixit wahan ja ke baithi kaise? So, that was our round-up of the best jokes that we came across. We know we might have missed many. So, here is the thing. Why don't you tag us on Twitter @latestly. See you in a month's time once again.